Sometime after midnight, on a moonless October night turned harsh by a fine, windswept rain, one of the men I liked least in the world was murdered in a field near Bedford, just south of the city...The detectives went looking for suspects-people whose histories with Jefferson were adversarial and hostile. At the top of that list, they found me. 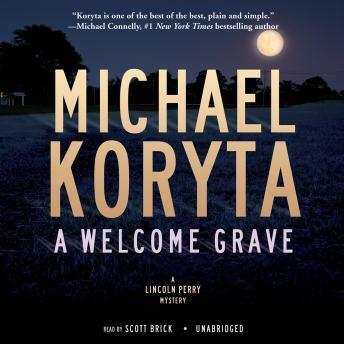 So begins A Welcome Grave, the third novel by award-winning mystery writer Michael Koryta featuring private investigator Lincoln Perry. Once a rising star on the Cleveland police force, Perry ended his career when he left one of the city's prominent attorneys, Alex Jefferson, bleeding in the parking lot of his country club-retribution for his affair with Perry's fiancée. Now Jefferson is dead, the victim of a brutal murder, and his widow has called upon Perry for a favor he knows he shouldn't grant but can't turn down: to find Jefferson's estranged son, partial beneficiary of the dead man's fortune. The case is simple enough, a routine "locate," and he'll be paid plenty of money for the work. The encounter should be simple, too: a brief exchange of information and maybe an empty condolence before Perry gets back into his truck and returns home. Instead, he's loaded into a police car and taken to a rural jail while Jefferson's son is zipped into a body bag. Perry soon learns that Jefferson's millions are the target of a thirst for revenge that hasn't been satisfied by blood. As a pair of deadly assailants push deep into the investigator's life, they bring with them police from two states who are determined to see Perry in jail. Building on the skill that prompted the Toronto Sun to call him "one of America's best young mystery writers," Michael Koryta makes A Welcome Grave an intense exploration of the lengths to which a desperate man is forced to go to clear his name and solve a crime. This is a thrilling new book that justifies the critical acclaim and solidifies his role as an emerging talent among today's top writers.